I'm not stating anything new when I say that SO has a problem with many, many duplicate questions, as well as a large number of low quality questions. When users ask new questions, we currently try to steer them to existing good questions by recommending related or duplicate questions as they are typing. What if we could catch them before they hit Ask Question in the first place? As you can see, the eye is drawn first to the half-screen sign up form, and then to the blue Ask Question button immediately below that. The subtle Search bar, light gray and located above the area of the screen the user has already looked at, fades into the background. The large font of "Top Questions" and the blue background of the "Ask Question" button draw one's eye to that area of the screen, and again the Search bar is overlooked. 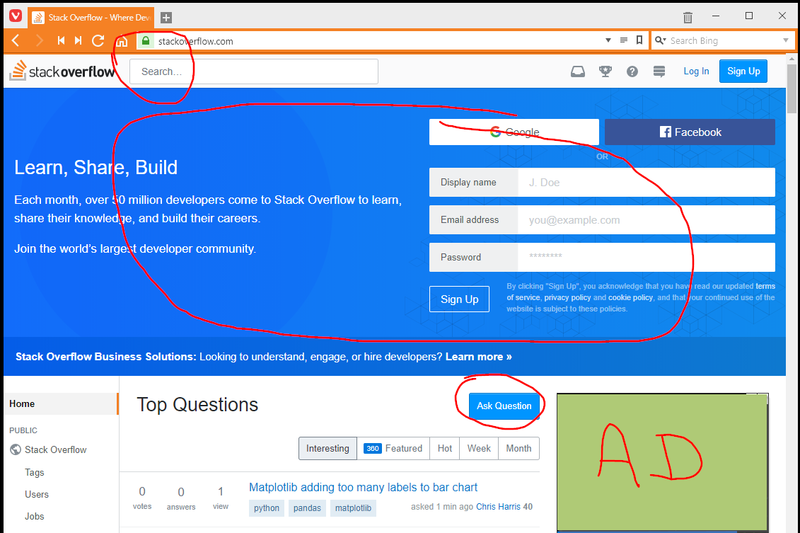 This might be a pipe dream, but with the volume of already-answered questions that are already in the SO corpus, wouldn't we prefer to steer new (and returning) users to the Search bar rather than the Ask Question button? TL;DR: Search should stand out more than Ask Question. Browse other questions tagged feature-request search-box . Why should we use the search bar at the top right? Ask a question!